October 30, 2012 / P.J. A search for finding discs that fit his style led Brian Rogers to a much bigger commitment in the sport of disc golf. And like that inbounds Disc Golf was born. Rogers, the owner of the company and the author of its newest publication — the inFlight guide, has been playing disc golf for three years. Rogers said he got hooked on the sport within the first two or three holes and, from there, the obsession grew. As it is with many people, real life makes playing time limited, but he said he’s constantly thinking about disc golf. “Whether it’s following disc golf forums, reading disc golf blogs or brushing up on the current disc golf news and players standings, I’m surrounded by a disc golf cloud,” he said. Rogers is a data guy. His education is in computers/business and IT, so data is obviously a massive part of his life. From that, he said he tried to get the data to tell him something, no matter how he’s working with it. That kind of thinking worked its way into disc golf, too. It was almost painful to try and figure out what flight rating to use. The process became frustrating. During his early playing and research days, he said he constantly asked himself a lot of questions. Should he use Innova’s system? If so, how does one evaluate Discraft’s discs? How about Marshall Street’s guide? But how would that relate to the flight path of the disc? Then there’s Joe’s Universal Flight Chart. It covers a lot, but how does that relate to a system such as Innova’s? It’s things like that this that could make a disc golfer’s head spin. That confusion led Rogers to his flagship product — the inFlight Guide, which works to give universal flight charts to hundreds of discs. Initially, Rogers used independent data, such as Joe’s Flight Chart. Then he began building a model to display graphic flight charts based on said data. Still, Rogers said he wasn’t comfortable using a manufacturer’s flight guide. His reason was the systems get player’s into the ballpark of how the disc should fly, but it’s also a marketing tool to try and get people to buy more discs. Sample pages from the inFlight Guide. Rogers developed an algorithm to normalize each of the flight ratings. For his inFlight guide, 15 different sources were used with as many as six sources were used with any one disc. He said it’s basically the Rosetta Stone of disc flight ratings. From this, the Relative Stability Scale was born. 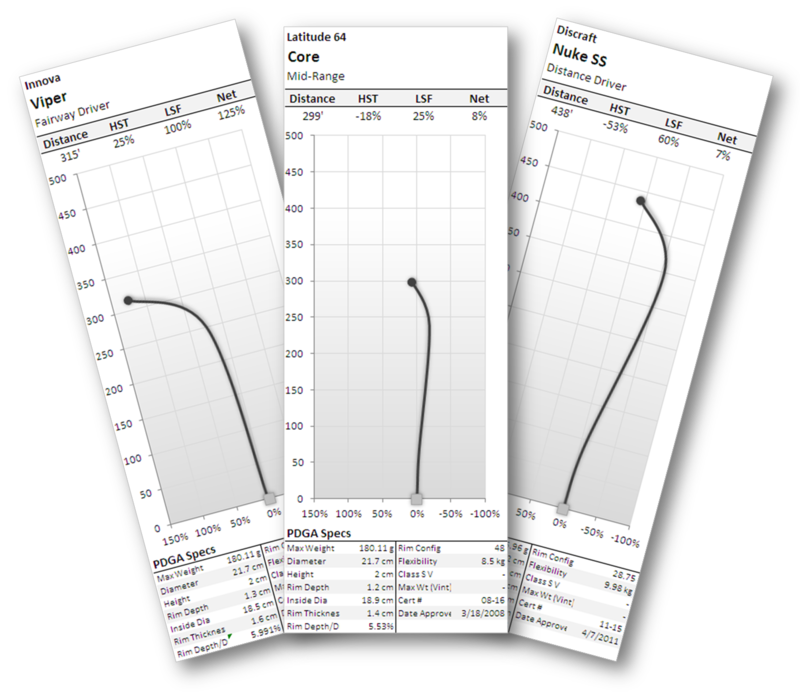 What this does is shows the flight characteristics relative to a maximum and minimum range of values, which are displayed as a percentage. This, in theory, simplifies flight values. The guide is more than 110 pages and includes more than 370 discs, representing 30 manufacturers. The book was designed to be small enough to tuck into your bag, allowing a disc golfer to carry it with him or her on the course. The guide is also constantly updated online. 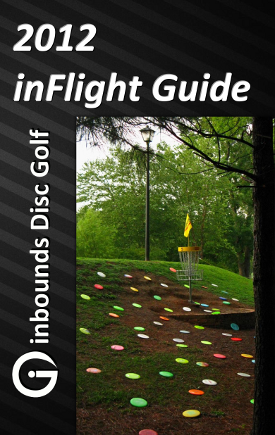 Besides the flight guide, inbounds Disc Golf is much like other companies involved with the sport — it tries to expand and improve the sport. “Since I started playing disc golf and especially since staring this company, I’ve been impressed with the sense of camaraderie within the disc golf community,” Rogers said. 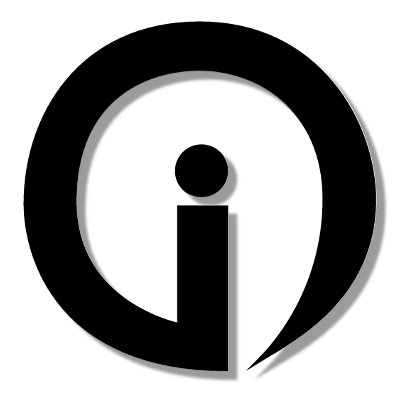 Though in its infancy as a disc golf company, inbounds seems to be moving in the right direction with a contribution that many players will be able to utilize.